“Moved by their Christian faith and sustained by a faith in themselves, a little band that numbered scarcely a score of persons gathered near Seven Corners in Minneapolis [in 1903] and formed Grace Evangelical English Lutheran congregation. This was at a time when many Lutheran churches identified themselves by nationality background. The name did not mean, however, that Grace congregation was in any way English in background. It was only meant to signify that here was a church in which English was spoken. 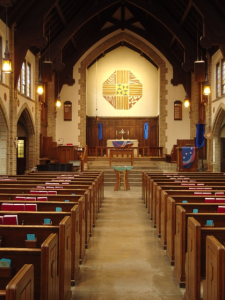 “Grace was the first English-language church of the Augustana Synod in Minneapolis. Though English was its official language, members of Grace had not forgotten their Swedish origins nor their mother tongue. Its bilingual pastor conducted services in Swedish every Sunday afternoon, more as a public service than as official duty. Swedish language services continued with growing infrequency for the next 20 years. After a few years, Grace and Sharon were encouraged by the Augustana Synod to consider a merger so that a stronger church could minister both to the neighborhood and to the growing University community. The synod purchased two lots on a then-empty block at Harvard and Delaware Streets SE. After some resistance, the two churches called a pastor together and began the process of merging. The pastor, Rev. C.A. 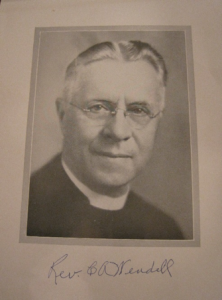 Wendell arrived in 1914 and worked to blend the two congregations, especially working out a plan to accommodate worship in both English and Swedish. He also worked very hard to raise nearly $30,000 to build the new church building. The building process began in late 1915 and the new church was dedicated in 1917. The church architecture reflects the desire to be modern, using the emerging Arts and Crafts style in combination with the prevailing English Gothic. Pastor Wendell remained at Grace Church for over 30 years. He not only seamlessly joined two congregations but he was a strong advocate, and perhaps a lonely voice, for peace and justice through the two World Wars of the twentieth century. Under Pastor Wendell’s leadership, Grace thrived, reaching over 630 members by the 1940’s. The neighborhood consisted mostly of homes and apartment buildings and the University was still a few blocks away. Many people walked to church. Music was an important feature of worship under the leadership of organist and choir director, Edith Byquist Norberg, who capped her choir membership at 50. Grace also installed a full pipe organ in 1942 which, after extensive renovations, is still used today. Pastor Wendell’s congregation continued to call him back to leadership until his retirement at almost 80 years of age. Pastor James Claypool arrived in 1946 and served the congregation until leaving for mission work in 1955. Pastor Claypool was succeeded by a young pastor who had been serving in Brooklyn, NY. Pastor Vincent Hawkinson, known to most as “Vince”, became a prophetic voice in the Lutheran Church. Like Pastor Wendell, Vince felt very strongly about peace and justice and preached fiery sermons on race relations, war, and other topics of the day. He was best known around the campus community for his active involvement in opposing the Vietnam War and in aiding draft resisters. While Vince attracted people to Grace who were hungry for this visionary leadership, some members were uncomfortable and left. Also, the University was expanding and pushing out many of the homes and apartment buildings. The health science towers were built and the Grace Church building only survived through the intervention of University Regent, former Governor of Minnesota, and former Grace member, Elmer Andersen. The land to the south of the church, which had recently been used a parking lot, was traded to the University for a small plot across Harvard St. During these years, membership numbers shrank and the church had to rely on synod support to make ends meet. Nevertheless, the congregation held together and continued to serve both the neighborhood and the university community. Pastor Hawkinson retired in 1985 and the church called Pastor Verlyn Smith who had had experience in campus ministry. During his tenure, Grace began to grow again, attracted students and former students and developing a variety of new worship and congregational experiences. 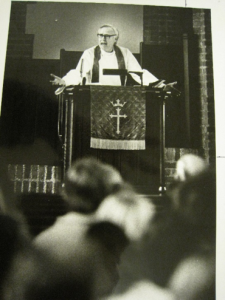 When Verlyn retired in 1993, Grace called a clergy couple, Pastors Mary Halvorson and Dan Garnaas. There seemed to be little money to expand the clergy position from one pastor, so this team was called to a 1 1/8th call. They shared not only a job, but an office, and also the duties of parenting their three young children. Pastors Mary and Dan shared the historic commitment of Grace to peace and justice and also worked to enhance the worship experience, build up the ties to Lutherans around the metro and at the seminary, and expand the support of family and community congregants. A second, early service was added; Sunday School children now worshipped with their families in church; and the congregation was challenged to deliberately live out the value of hospitality. Music in worship grew and increased its “eclectic but excellent” nature. By 2010, Grace had over 600 members again and the pastors were now both full-time employees. A few years later, Grace added a part-time Associate Pastor, Melanie Heuiser Hill. Early in the Garnaas-Halvorson tenure, the growing congregation began exploring the possibilities of expanding and enhancing the 1917 church building. The discussions were deep and intense. 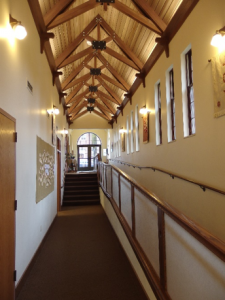 Grace saw itself as a congregation with very limited resources and was unsure that spending money on an expanded building should be a priority. However, the church was not handicap-accessible, the pastors were sharing one office, and the 1917 bathrooms had served their time. With the leadership of committed congregants and the pastors, plans were developed, funds were raised, and an addition was built on the south side of the church in 2005. 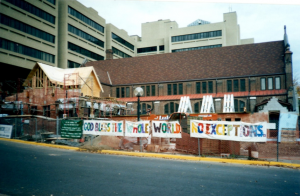 Grace now had a street level entrance, an elevator, a large kitchen, offices, a new meeting space, and new bathrooms. The architects at Miller Dunwiddie did an excellent job matching the addition to the original building and won two major awards for their design. In 2016, developers bought the Grace parking lot as part of the land needed for a 25-story high rise on Harvard and Washington. This new money now allows the congregation to plan for perhaps another addition and other ways to be faithful stewards of this gift. In 2016-2017, Grace is celebrating the 100 years our building has stood on Harvard and Delaware. We are now the oldest building in the neighborhood, having seen tremendous change around us. Over this time, Grace has been a steady presence and witness to God’s love. We look forward to the next 100 years.